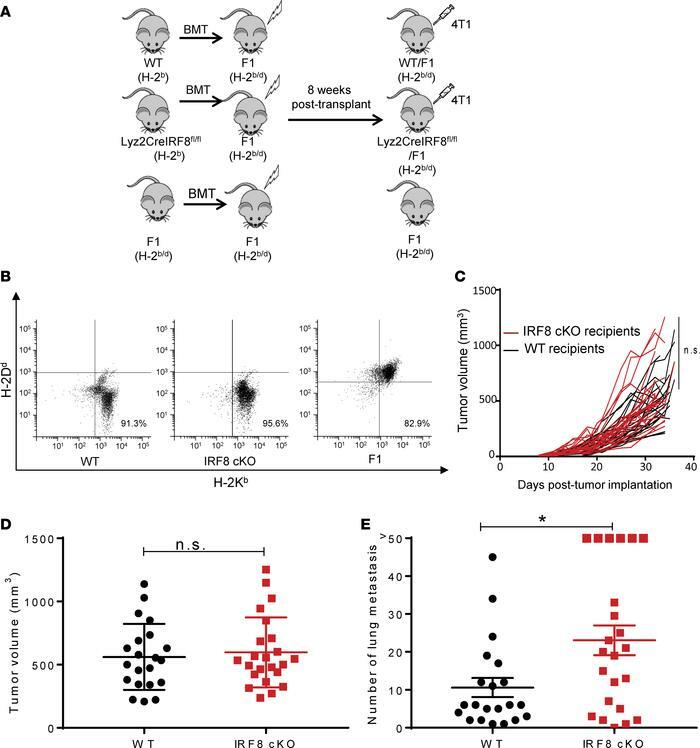 Reduced IRF8 expression in macrophages leads to increased 4T1 spontaneous lung metastasis. (A) Experimental design for the BM chimera tumor model. CB6F1 mice (H-2b/d) were lethally irradiated and then transplanted with WT, IRF8-cKO (Lyz2-CreIRF8fl/fl), or F1 T cell–depleted BM cells. Eight weeks after transplant, reconstitution was determined, followed by tumor implantation. (B) Flow cytometry plots of the reconstituted WT, IRF8-cKO, and F1 genotypes, as determined by peripheral blood analysis 8 weeks after transplant. (C) The chimeric recipients were then implanted with 4T1 cells (5 × 104) in the fourth mammary gland, and tumor growth was measured. (D) End-point tumor volumes for WT or IRF8-cKO hosts, which were not significant. (E) Lungs were collected ~30 days after tumor implantation for histopathologic analyses. Whole lung sections were H&E stained and analyzed in a blinded manner for the number of metastatic foci. Metastatic counts beyond 50 were considered too numerous to count accurately and, thus, are recorded as >50. Metastasis in the IRF8-cKO recipients, compared with the WT controls, was statistically significant by a 2-tailed Mann-Whitney U test (mean ± SEM of 21–23 mice per group, *P < 0.05). Data in C–E were compiled from 4 separate experiments.